Pest extermination isn't for the faint of heart. Sure, you get to wield insecticide similar to a Ghostbusters' proton pack, but the consequences of reckoning with a bunch of violent bugs are far more severe than fictitious ghosts. Take, for example, the exterminator Jude Verret, who entered a giant hornet's nest that completely took over a family's shed in Patterson, Louisiana. In an episode that is likely to make you hide under a blanket and perhaps give you recurring nightmares, Verret scraps with these teeming insects like routine business. 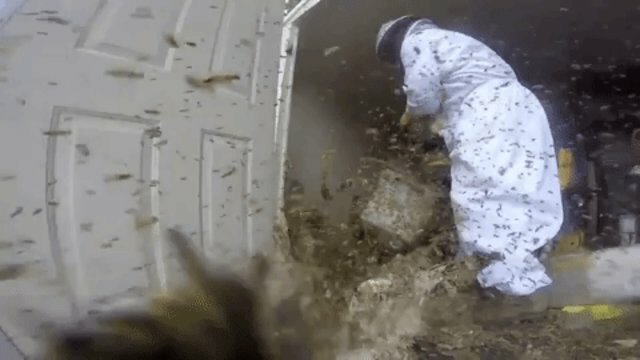 Honestly, though, the hornets completely envelope this shed, blanket the walls, with a constant buzzing sound reverberating throughout the video. No one needs to tell you this is terrifying. Luckily, though, there's people like Verret willing to enter the abyss. Because Verret isn't a mortal human being, he cleaned up the hornet infestation in a mere 45 minutes, and didn't suffer a single sting. So let his courageousness be a lesson to anyone with a shed in their backyard: clean that thing before a biblical plague of hornets finds it.